For the South African antelope, see Grey rhebok. Reebok (/ˈriːbɒk/) is an English footwear and apparel company, subsidiary of German sportsgiant Adidas since 2005. Reebok produces and distributes fitness, running and CrossFit sportswear including clothing and footwear. It is the official footwear and apparel sponsor for Ultimate Fighting Championship (UFC), CrossFit, and Spartan Race. In 1958, Reebok was established as a companion company to J.W. Foster and Sons, founded in 1895 in Bolton, Lancashire, England. From 1958 until 1986, all Reebok apparel featured the U.K. flag. The Union Jack is featured on Reebok's "Classic" line of apparel. The company's global headquarters are located in Boston, Massachusetts, U.S., with regional offices in Amsterdam, Montreal, Hong Kong, and Mexico City. In November 2016, Reebok announced they would be moving their headquarters from the Boston suburb of Canton to the innovation and design building in the seaport district of South Boston. The reasons for the move, according to the company, were to be located in an urban environment that is more desirable to millennial workers and to “clarify the roles” of United States offices. The move was completed in the fall of 2018. In 1895, Joseph William Foster at the age of 14 started work in his bedroom above his father's sweet shop in Bolton, England, and designed some of the earliest spiked running shoes. After his ideas progressed, he founded his business 'J.W. Foster' in 1900, later he joined with his sons and changed the company name to J.W. Foster and Sons. Foster opened a small factory called Olympic Works, and gradually became famous among athletes for his "running pumps". For pioneering the use of spikes, the company's revolutionary running pumps appear in the book, Golden Kicks: The Shoes that changed Sport. The company began distributing shoes across the Union Jack flag which were worn by British athletes. They were made famous by 100m Olympic champion Harold Abrahams (who would be immortalized in the Oscar winning film Chariots of Fire) in the 1924 Summer Olympics held in Paris. In 1958, in Bolton, two of the founder's grandsons, Joe and Jeff Foster, formed a companion company "Reebok," having found the name in a South African dictionary won in a running race by Joe Foster as a boy. The name is Afrikaans for the grey rhebok, a type of African antelope. 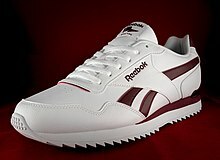 In 1979, at the Chicago International Sneaker Trade show an American businessman, Paul Fireman, took notice of Reebok. Fireman was working for team sports and negotiated a deal to license and distribute the Reebok brand in the United States. The division was called Reebok USA Ltd. Later that year, Fireman introduced three new shoes to the market at $60. By 1981, Reebok reached more than $1.5 million in sales. In 1982, Reebok debuted the Reebok Freestyle aerobics shoe, the first athletic shoe designed for women. Fitness professional Gin Miller became the face of "Step Reebok," the company's aerobics fitness campaign and program. The following year, Reebok's sales were $13 million. The company began expanding from tennis and aerobics shoes to running and basketball throughout the mid to late 1980s, the largest segments of the athletic footwear industry at the time. Fireman bought the British-based parent company in 1984. In 1985, Reebok had its initial public offering on the New York Stock Exchange under the ticker symbol RBK. In 1986, Reebok switched its logo from the Union Jack flag it had since its founding, to the vector logo with an abstract Union Jack streak across a race track. The switch signaled the transition of the company into a performance brand as it began licensing deals with professional athletes in the NBA and NFL. During the 1980s, Reebok began introducing sports clothing and accessories (alongside entering the college/pro sports arena), along with a new line of children's athletic shoes (called 'Weeboks') at the end of 1980. By the end of the year, Reebok's sales were about $1 billion. One of the company's most signature technologies, the Reebok Pump, debuted in 1989 with more than 100 professional athletes wearing the footwear by 1992, including Shaquille O'Neal. Reebok named Carl Yankowski president and chief executive officer of the brand in 1998, replacing former president Robert Meers. Yankowski stepped down one year later to accept an executive position at another company. Reebok chairman and CEO Paul Fireman took over as president for the first time in 12 years. Reebok signed Venus Williams after winning singles titles at Wimbledon and the 2000 Summer Olympics. In December 2000, Reebok signed a 10-year licensing agreement with the NFL for the exclusive rights to manufacture and sell NFL licensed merchandise, including uniforms and footwear, for all 32 teams. In 2001, Reebok became the exclusive apparel outfitter for the 29 teams in the NBA, and 16 WNBA teams for ten years beginning in the 2004-2005 season. The deal also added the Reebok vector logo to the 2004 U.S. Olympic basketball team's uniforms. Later in 2001, Jay Margolis was named as Reebok's president and COO. After launching retail flagship stores in China, Dhaka, London, Los Angeles, New York, Philadelphia and Tokyo, Margolis resigned in October 2004. Fireman took over as president after signing a new long-term employment agreement with the Reebok board of directors. In 2003, Reebok also became the official uniform and apparel provider for the Canadian Football League, which took effect in 2004. Reebok acquired official National Hockey League sponsor CCM in 2004. The company began manufacturing ice hockey equipment under the CCM and Reebok brands. Reebok phased out the CCM name on NHL authentic and replica jerseys, using the Reebok logo since 2005. CCM became Reebok-CCM Hockey in 2007. Reebok moved most of its hockey equipment lines to CCM after 2015. In August 2005, Adidas acquired Reebok as a subsidiary, uniting two of the largest sport outfitting companies, but maintaining operations under their separate brand names. Adidas acquired all of the outstanding Reebok shares and completed the deal valued at $3.8 billion. Following the acquisition, Adidas replaced Reebok as the official uniform supplier for the NBA in 2006 with an 11-year deal that includes the WNBA and replica jerseys and warm-up gear. Reebok named Paul Harrington president and CEO of the company in January 2006, replacing Paul Fireman who was acting president since 2004. Harrington joined the company in 1994 and was Reebok's senior vice president of global operations and chief supply chain officer. In 2010, Reebok announced a partnership with CrossFit, a fitness company and competitive fitness sport, including sponsoring the CrossFit Games, opening CrossFit studios, and introducing a line of co-branded footwear and apparel for Fall 2011. In 2011, Reebok debuted the CrossFit delta symbol on the brand's fitness apparel line. Around that time, Reebok, as it slowly began to lose its contracts to make sports uniforms and apparel to professional sports leagues and college teams (its last uniform rights contract, with the NHL, ended in 2017) began repositioning itself as a largely fitness-oriented brand, just as it had been during the 1980s and early 1990s. In 2013, Reebok announced another fitness partnership with Les Mills, a group fitness and team training program in eighty countries in more than 15,000 studios. The agreement included Reebok footwear and clothing integration into Les Mills' fitness programs and media marketing. By July 2013, the red delta sign began showing up on all of Reebok's fitness collections. The brand announced it was phasing out the vector logo and replacing it with the delta sign, making it the company's second logo change in more than 120 years. The delta symbol represents the three pillars of positive self-change including mental, physical and social, as Reebok increases its presence in the fitness industry with yoga, dance, aerobics and CrossFit. Reebok's parent company, Adidas, is headquartered in Herzogenaurach, Bavaria, Germany, while the Reebok world headquarters remains located in Boston, Massachusetts, U.S.A. Reebok EMEA (Europe, Middle East, Africa) has its regional office in Amsterdam, Netherlands. The company also has additional regional offices located in Panama City (Reebok Latin America), Shanghai (Reebok Shanghai International Commerce Centre), Singapore, Taikoo Shing, and Toronto. Reebok first entered the South Korean market in 1987 and has since been making substantial revenue in South Korea. It is shown that it is the third most popular sports brand in South Korea. Through the merger and acquisition of Adidas International, Reebok is no longer listed as a corporation in South Korea. Reebok designs, manufactures, distributes and sells fitness, running and CrossFit sportswear including clothing and footwear. The clothing line includes t-shirts, hoodies and pants among other items.The brand has also collaborated with other companies to produce fitness equipment and workouts. The company has released numerous notable styles of footwear including the 1982 introduction of the Reebok Freestyle that was manufactured and marketed for women. In 1984, the shoe accounted for more than half of the Reebok sales. Following the aerobics trend from the 1980s to early 1990s, Reebok also released workout programs called Reebok Step beginning in 1989. The brand also introduced one of their most signature shoes, The Reebok Pump. The footwear collection was released as a men's basketball shoe and the world's first fully adjustable fit controlled with manual air allocation. The Reebok Ventilator, a line of lightweight athletic shoes with vented side panels, was first introduced in 1990. In 1996, Reebok signed a $50 million endorsement deal with Allen Iverson when he signed with the Philadelphia 76ers. Iverson collaborated with Reebok during his contract to create the second-longest running basketball shoe line in history, beginning with the Question shoe in 1996 and ending with Answer XIV. In 2010, the brand released Reebok Zig, an athletic footwear technology and collection of shoes include zigzag foam soles designed to push athletes forward. The Reebok Nano was released in 2011 and is the first official CrossFit shoe. The company has also partnered up with Les Mills and CrossFit to produce more fitness apparel, footwear, and workouts. Reebok released the Z-Series foam, a combination of dense midsole and outsole so the foam is cushioned but not worn-down. The foam debuted on the ZQuick TR with Reebok's new delta logo in 2014. Reebok Future innovation house has developed a new technology they call Liquid Factory. A robot will extrude liquid polyurethane and "draw" shoe components without the use of traditional shoe molds. In 2017, the UFC announced the launch of a new collection under the name Fight Night Collection that includes an upgraded version of the Reebok-branded apparels. In 2018, Victoria Beckham being a long-term design partner with Reebok launched her first collection inspired by Shaquille O'Neal. Reebok sponsored kits for a top seeded Indian Football club, Mohun Bagan A.C., in the year 2006-2011. Later it sponsored kits for Indian Premier League teams, such as the Royal Challengers Bangalore, Kolkata Knight Riders, Rajasthan Royals and Chennai Super Kings in the first edition of the league held in 2008. However, for the second edition held in 2009, the sponsorships included Royal Challengers Bangalore, Kolkata Knight Riders, Chennai Super Kings, Kings XI Punjab kits. One of Reebok's most prominent athletes, Indian cricketer Mahendra Singh Dhoni, was named by Forbes as the world's thirty first highest-paid sportsperson in June 2012. At the time of the article, Dhoni endorsed more than 20 other brands in deals that were cumulatively valued at US$23 million. The company maintained its relationship with its origins in the UK through a long-term sponsorship deal with Bolton Wanderers, a Championship football club, however, in 2009, Bolton changed their sponsorship to 188bet. When the team moved to a brand new ground in the late-1990s, their new home was named the Reebok Stadium. Several other English clubs, such as Liverpool F.C., had Reebok sponsorship deals up until the purchase by Adidas, but most have since switched to either the parent brand (which has a long history in football) or another company altogether. In April 2014, Bolton Wanderers officially announced the Reebok Stadium would be officially rebranded in a new sponsorship deal with sportswear manufacturer Macron, who will manufacture the club's kits and sponsor the stadium under the name Macron Stadium in a four-year deal announced by the club's chairman, Phil Gartside. In Germany, Reebok sponsored football club 1. FC Köln. In 2006, FC Barcelona and France national team striker Thierry Henry (then playing for Arsenal) signed a deal to join the "I Am What I Am" campaign on August 1, 2006. Manchester United winger Ryan Giggs has also done "I Am What I Am" commercials. Andriy Shevchenko started his endorsement deal with the company in 2006. In February 2019, the Russian subsidiary faced a scandal. While adapting the brand's "Never apologize for being strong" ad campaign, Reebok posted pictures on its social media accounts which encouraged women to try facesitting, saying ("To sit on a man's face instead of sitting on a needle of man's approval"). The public had a negative reaction to this and several employees were fired. The headquarters also had to issue an apology. In 2004, Reebok entered into a deal that allows them the rights to manufacture Canadian Football League (CFL) onfield jerseys, sideline gear and footwear; this deal ended in 2015. In Mexico, Reebok was kit provider of Chivas de Guadalajara before the team was taken over by parent company Adidas in 2011. Reebok shoes were featured as product placement advertising on the Nickelodeon game show Double Dare in the 1980s. Reebok signed a four-year deal to become the official shoe supplier to Major League Baseball (MLB) in 2004; Reebok also was given the rights to be the official uniform and apparel provider of the Canadian Football League (CFL) that same year; this alliance lasted until 2015. Reebok held the rights to produce the on-ice "EDGE" Uniform System, performance clothing and training footwear of the National Hockey League (NHL) in a 10-year agreement from 2007 to 2017. On December 2, 2014, the Ultimate Fighting Championship (UFC) announced a six-year deal with Reebok, which began in July 2015. In July 2018, Reebok Boston Track Club announced to be led by coach Chris Fox from Syracuse University. Rapper Jay-Z became the first non-athlete to get a signature shoe from Reebok. The "S. Carter Collection by Rbk" was launched on November 21, 2003, and the S. Carter sneaker became the fastest-selling shoe in the company's history. Later, Reebok made a deal with rapper 50 Cent to release a line of G-Unit sneakers, and artists such as Nelly and Miri Ben-Ari have become spokespersons for the company. Reebok also signed Scarlett Johansson and introduced her own line of clothing and footwear called Scarlett Hearts, part of the Rbk Lifestyle Collection. Pop singer Ariana Grande signed to Reebok in 2017. In the 2016 Gigi Hadid joined the company. Reebok also produce shoes for Emporio Armani under the label EA7. Reebok was the uniform provider for Brazilian clubs Cruzeiro, Internacional and São Paulo FC and Uruguayan clubs Peñarol . Reebok sponsorships include individual professional athletes, the National Hockey League, the American Hockey League, the ECHL, the Canadian Hockey League, the National Lacrosse League, and the Portugal national basketball team. Poland - only in Serbia and Tahiti matches in 9 and 12 January, 2019. The Reebok Foundation operates the Build Our Kids' Success (BOKS) program to provide US schoolchildren with physical activities before the school day. Reebok funds the program with direct grants and by contributing a percentage of shoe sales. ^ "Our Brands – adidas group". Adidas-group.com. Archived from the original on July 19, 2011. Retrieved May 6, 2011. ^ a b Berman, Dennis K.; Kang, Stephanie; Karnitsching, Matthew (2005). "Adidas Nears Deal to Buy Reebok In Effort to Gain Ground on Nike". The Wall Street Journal. Retrieved March 23, 2015. ^ Stuart Elliot (August 4, 2005). "Adidas's Reebok Purchase Sets a Challenge for Nike". The New York Times. Retrieved March 23, 2015. ^ Julie Cruz (September 23, 2013). "Reebok Turns to 'Race From Hell' to Revive Former Glory". Bloomberg. Retrieved March 23, 2015. ^ a b c d Rourke, Elizabeth; Hedblad, Edna; Salamie, David (1999). International Directory of Company Histories: "Reebok International Ltd.". ^ "Reebok unveils new 'delta' logo as the sportswear company moves from professional athletes to fitness buffs". Daily Mail. October 6, 2016. 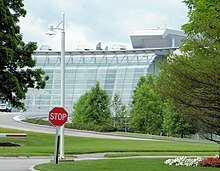 ^ "Reebok World Headquarters | NBBJ". www.nbbj.com. Retrieved August 3, 2017. ^ Chesto, Jon (November 3, 2016). "Reebok plans a big move — and some job cuts". Boston Globe. Retrieved November 4, 2016. ^ Williams, Michelle (July 18, 2017). "Inside Reebok's new 220,000-square-foot headquarters in Boston's Seaport District". masslive.com. Retrieved April 25, 2019. ^ a b "Adidas buys Reebok to conquer US". The Telegraph. October 6, 2016. ^ a b c d Colea, Jason (2016). Golden Kicks: The Shoes that Changed Sport. Bloomsbury Publishing. pp. 14–16. ^ a b Vartanig G. Vartan (May 15, 1986). "Market Place; The Surging Reebok Stock". The New York Times. Retrieved February 24, 2015. ^ a b c "Reebok: A running history". LesMills. June 2, 2014. Archived from the original on February 24, 2015. Retrieved February 23, 2015. ^ C.Y. Ellis (November 8, 2013). "The History of Reebok in the Sneaker Industry". HoopsVibe. ^ McDonald, Mark A.; Milne, George R. (1999). "Cases in Sport Marketing". Jones and Bartlett Publishers. pp. 63–86. ^ Stuart Gannes (May 23, 1988). "America's Fastest Growing Companies". Fortune Magazine. Retrieved February 25, 2015. ^ a b Vartanig G. Vartan (January 21, 1986). "Market Place; A Brisk Pace Is Set by Nike". The New York Times. Retrieved February 25, 2015. ^ a b c Natalie Zmuda (February 28, 2014). "Change: Reebok Logo Indicates Shift From Pros to Crossfit". Advertising Age. Retrieved March 1, 2015. ^ "Search | Brands of the World™". www.brandsoftheworld.com. Retrieved April 25, 2019. ^ a b John Brownlee (March 13, 2014). "How Reebok Became The Brand For Crossfit Junkies". FastCode. Retrieved March 1, 2015. ^ Clarence Petersen (March 15, 1987). "The Training Of Trendy Tots". The Chicago Tribune. Retrieved March 1, 2015. ^ Russ Bengtson (February 25, 2013). "10 Sneakers That Debuted Significant Technology". Complex Magazine. Retrieved March 1, 2015. ^ "COMPANY NEWS; Reebok Introduces Inflatable Shoe". Reuters. November 1, 1989. Retrieved March 1, 2015. ^ "Reebok 'Pump' To Sell For $170". Sun Sentinel. September 14, 1989. Retrieved March 1, 2015. ^ "Can Reebok Regain Its Balance?". Bloomberg Businessweek. December 19, 1993. Retrieved March 1, 2015. ^ "Former Sony Exec to Head Reebok Brand". Los Angeles Times. August 28, 1998. Retrieved March 1, 2015. ^ a b "Yankowski resigns as president of Reebok-brand shoes, apparel". The Baltimore Sun. December 2, 1999. Retrieved March 1, 2015. ^ Richard Sandomir (December 22, 2000). "TENNIS; Having Style Pays Off for Venus Williams". The New York Times. Retrieved March 2, 2015. ^ "Reebok Granted NFL Apparel Licensing Rights". Los Angeles Times. December 20, 2000. Retrieved March 2, 2015. ^ "Reebok nets NBA". CNN. August 1, 2001. Retrieved March 2, 2015. ^ "NBA Signs 10-Year Deal With Reebok". Los Angeles Times. August 2, 2001. Retrieved March 2, 2015. ^ Andy Bernstein (August 6, 2001). "Reebok locks up more than NBA with 10-year licensing deal". Sport Business Daily. Retrieved March 2, 2015. ^ "Reebok locks up more than NBA with 10-year licensing deal". Sport Business Daily. December 6, 2001. Retrieved March 2, 2015. ^ "High exec at Reebok resigns". Boston Business Journal. October 21, 2004. Retrieved March 2, 2015. ^ "Reebok Inks Official Supplier Deal with CFL". SGB Media. October 14, 2003. Retrieved December 11, 2018. ^ Cam Merritt (January 28, 2015). "What Does CCM stand for on Hockey Equipment?". LiveStrong. Retrieved March 2, 2015. ^ Petrecca, Laura; Howard, Theresa (August 4, 2005). "Adidas-Reebok merger lets rivals nip at Nike's heels". USA Today. Retrieved March 3, 2015. ^ Sorkin, Andrew Ross; Feder, Barnaby J. (August 3, 2005). "Adidas Agrees to Acquire Reebok in $3.8 Billion Deal". The New York Times. Retrieved March 3, 2015. ^ Darren Rovell (April 18, 2006). "NBA laces up adidas for 11-year partnership". ESPN. Retrieved March 3, 2015. ^ "Harrington named CEO of Reebok Brand division". Boston Business Journal. January 10, 2006. Retrieved March 3, 2015. ^ Julie Cruz (May 29, 2013). "Adidas to Make CrossFit Delta Logo Symbol for Reebok Fitness". Bloomberg. Retrieved March 3, 2015. ^ "Why Reebok is Going Back to its Fitness Roots". www.eventmarketer.com. Retrieved April 25, 2019. ^ "Adidas Group Locations". Adidas. Retrieved February 23, 2015. ^ Nick Santora (December 11, 2013). "The History Of Cross Training". Sneaker Freaker. Retrieved February 23, 2015. ^ "Reebok Freestyle Recap". Sneaker Freaker. December 31, 2012. Retrieved February 23, 2015. ^ Vicky Hallett (August 25, 2009). "Step Aerobics Marks Its 20th Anniversary With a Celebration Led by Its Creator". Washington Post. Retrieved February 23, 2015. ^ Yale Schalk (November 14, 2009). "EXCLUSIVE: Reebok Pump Chronology". CounterKicks. Archived from the original on February 24, 2015. Retrieved February 23, 2015. ^ John Q Marcelo (October 24, 2014). "The Reebok Runners That Defined '90s Sneaker Culture". Complex Magazine. Retrieved February 23, 2015. ^ "End of an Era: The 13 Best Allen Iverson Shoes". NiceKicks. October 30, 2013. Retrieved February 23, 2015. ^ Rob Maaddi (November 28, 2001). "Iverson signs lifetime deal with Reebok". USA Today. Retrieved February 23, 2015. ^ "A History of Allen Iverson's Reebok Signature Sneaker Line". Sole Collector. June 7, 2014. Archived from the original on February 22, 2015. Retrieved February 23, 2015. ^ Riley Jones (January 5, 2014). "A Complete History of Suspension Soled Sneakers". Sneaker Report. Retrieved February 23, 2015. ^ Gabriel Simon. "Which Reebok CrossFit shoe is best for you?". WOD Review. Retrieved February 23, 2015. ^ Patrick Rishe (November 29, 2011). "Reebok's Attention to CrossFit Feedback Boost Branding and Product Quality Initiatives". Forbes. Retrieved February 23, 2015. ^ Gurvinder Singh Gandu (December 20, 2013). "Reebok Announces ZQUICK Footwear Collection for 2014". Sneaker Report. Retrieved February 23, 2015. ^ "Reebok's Liquid Factory could revolutionize shoe-making". Sports Illustrated. October 24, 2017. Retrieved May 26, 2017. ^ Mazique, Brian. "UFC And Reebok Announce New Fight Night Collection". Forbes. Retrieved September 26, 2017. ^ Park, Andrea. "Victoria Beckham's First Collection for Reebok Is Here—and It's Inspired by Shaq". Glamour. Retrieved August 10, 2018. ^ "Victoria Beckham's Reebok Merch Collection is a Stylish Slam Dunk Inspired by Shaq". Vogue. Retrieved August 10, 2018. ^ "Reebok Running Squad – Reebok Ambassador, Gautam Gambhir to flag off first RRS meet in the city". LiveMango. Archived from the original on September 25, 2011. Retrieved September 20, 2011. ^ "Reebok launches IPL merchandise". IndianTelevision.com. April 11, 2012. Retrieved March 23, 2015. ^ "Reebok". listcricketinfo.blogspot.com. Retrieved May 24, 2012. ^ "Enforcement Directorate books Reebok for retail sale in India". July 18, 2012. ^ Vidhi Choudhary (July 17, 2013). "Two main accused in Reebok case granted bail". Live Mint and the Wall Street Journal. Retrieved December 7, 2013. ^ Kurt Badenhausen (June 18, 2012). "The World's 100 Highest-Paid Athletes". Forbes. Forbes.com LLC™. Retrieved December 7, 2013. ^ David Kent (April 24, 2014). "Bolton to rename ground the 'Macron Stadium' this summer as part of deal". Daily Mail Online. Retrieved March 23, 2015. ^ "BWFC strike stadium and kit deal with Macron" (Press release). Bolton Wanderers. April 25, 2014. ^ Paul Gorst (April 24, 2014). "Bolton to change stadium name to Macron Stadium – but where does it rank in the worst arena names?". Daily Mirror. Retrieved March 23, 2015. ^ Marc Ambasna Jones (September 19, 1997). "Lucky Goldstar shuns Welsh RFU sponsorship". ZDNet. Retrieved March 23, 2015. ^ Bond, David (12 April 2006) "Henry drops bombshell by moving to Reebok". The Daily Telegraph. 12 April 2006. Retrieved 25 February 2014. ^ "Reebok Still in the Game". Soccer Bible. April 27, 2011. Retrieved March 23, 2015. ^ "Announcement of Shevchenko signs a deal with Rbk". Archived from the original on August 20, 2006. ^ "Andriy Shevchenko of Chelsea and Ukraine arrives via the Thames". Getty Images. Retrieved March 23, 2015. ^ "How Reebok ad campaign angered social networks". ^ "adidas to become Official Outfitter of the CFL". ^ "São Paulo Football Club Signs With Penalty For More Than $17M". Sports Business Daily. January 4, 2013. Retrieved March 23, 2015. ^ Banet-Weiser, Sarah (September 3, 2007). Kids Rule! : Nickelodeon and Consumer Citizenship. Duke University Press. ISBN 0822339935. ^ "CFL Retro With Reebok's Craig Ryan". Canadian Football League. September 2, 2008. Retrieved December 11, 2018. CFL and Reebok have just signed a new five-year contract extending the current deal that was signed in 2004. ^ Josh Kosman; Larry Brooks (February 1, 2014). "Adidas may distance Reebok from NHL". New York Post. Retrieved March 23, 2015. ^ Chris Carlson (July 23, 2018). "Former SU running coach Chris Fox will lead Reebok team that signed Justyn Knight". Retrieved July 23, 2018. ^ Chris Carlson (September 17, 2018). "Syracuse hires Brien Bell, right-hand man of Chris Fox, to lead running programs". Retrieved September 17, 2018. ^ Reebok Running (July 23, 2018). "Coach Chris Fox and Justyn Knight Sign on to Newly Established Reebok Boston Track Club". Retrieved July 23, 2018. ^ Mark Jewell (February 14, 2006). "Reebok's walk on wild side draws youngsters, critics". Boston.com. Retrieved March 23, 2015. ^ Greg Lindsay (September 1, 2004). "The Rebirth of Cool". CNN Money. Retrieved March 23, 2015. ^ Braden Galea (May 14, 2011). "Chivas Guadalajara agree deal with Adidas". Football Shirts News. Retrieved March 23, 2015. ^ a b "Reebok agreements with USA professional leagues". Corporate.reebok.com. Retrieved May 6, 2011. ^ ""PHPA Announces Partnership with Reebok-CCM Hockey", PHPA website, 26 February 2013". Phpa.com. February 26, 2013. Archived from the original on April 11, 2013. Retrieved June 6, 2013. ^ "Reebok and NLL extend partnership". Nll.com. Retrieved May 6, 2011. ^ 2015 Elvis Evora Photos - Standard Life Team GB Men v Portugal - Basketball, Zimbio.com, Retrieved 8 July 2016. ^ "Natalie Morales teams up with Reebok to create kids' shoes for charity". today.com. December 14, 2016. Retrieved March 14, 2017. Wikimedia Commons has media related to Reebok International Limited. This page was last edited on 25 April 2019, at 12:12 (UTC).